I always enjoy testing out products from new companies. Hanchor, a backpack and climbing gear company, is a relatively new company from Taiwan. They launched in 2012, and have since run a few successful Kickstarter campaigns. The campaign to fund the Breccia Travel Backpack was one of them. The Breccia is a very thoroughly thought out bag, and was designed with the traveler in mind. It can be used as a carry on backpack or a duffel bag in both adventure outdoor travel environments and urban settings. One of my favorite aspects of the Breccia backpack is it’s size. The backpack is large enough for week-long trips, or even long term travel, yet still fits within carry-on restrictions. 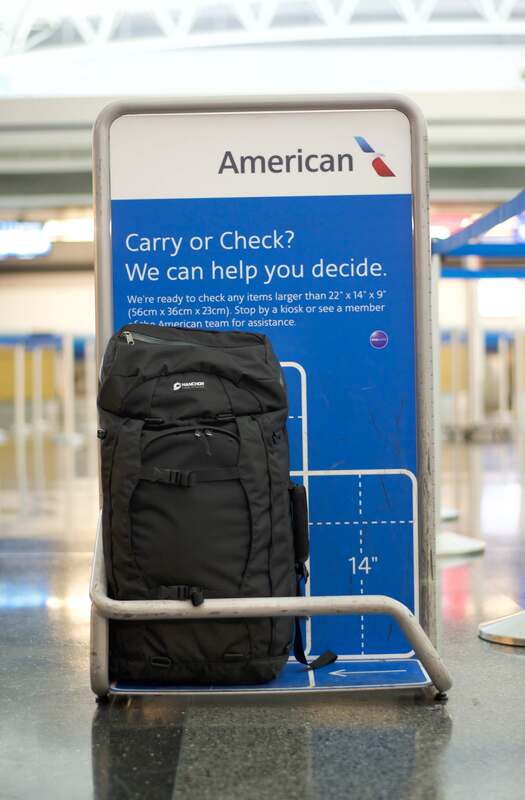 It falls right in the sweet spot (45 liters) of our best travel backpack sizes. If you do need to check the bag in, you can tuck the waist belt and shoulder straps in, so they won’t get caught on anything when being checked in. 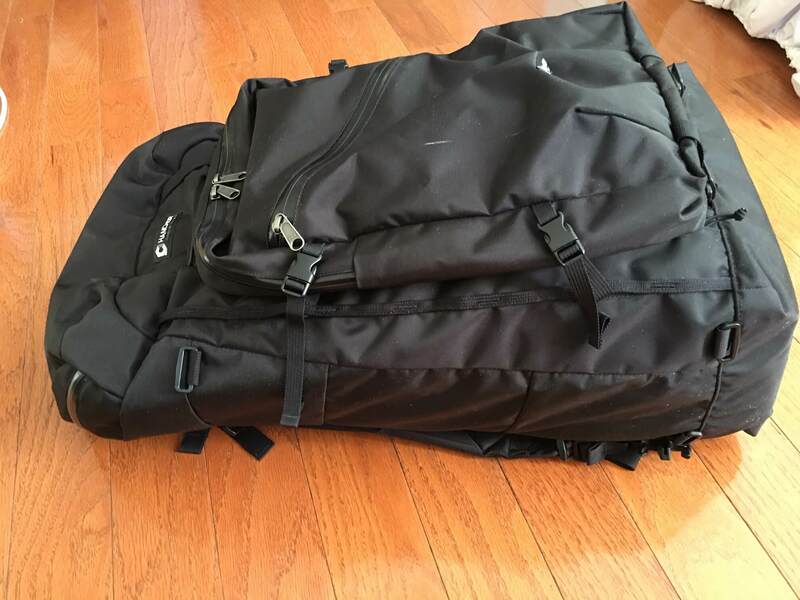 Read more: How Big Should My Travel Backpack Be? Unlike a lot of backpacks, the Hanchor Breccia can be opened two ways: (1) top loading (2) panel loading (suitcase style). This allows you to maximize the space in the bag, yet easily access your clothes, even if they’re packed at the way bottom of your backpack. The backpack is made of Cordura 420 denier nylon, which is a very durable material. It comes in black which has a low profile and slightly technical look. The backpack also resists water well. 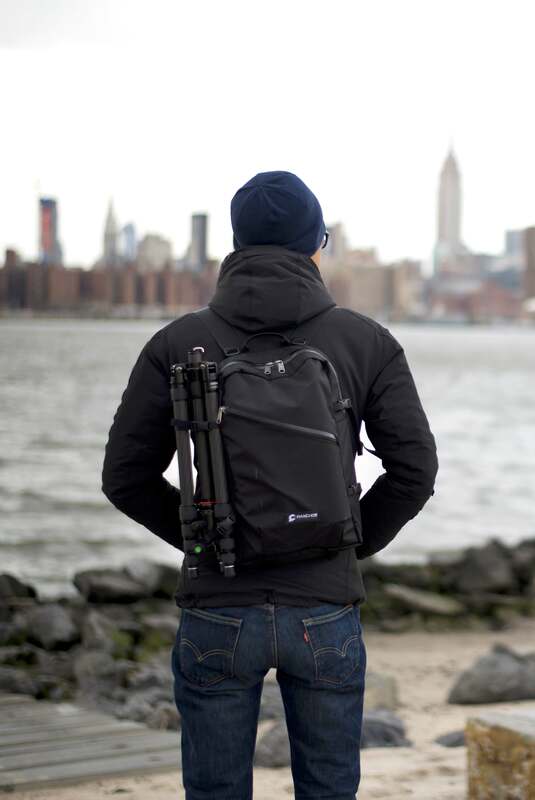 One of the great things about the Hanchor Breccia backpack is that it has a modular design. 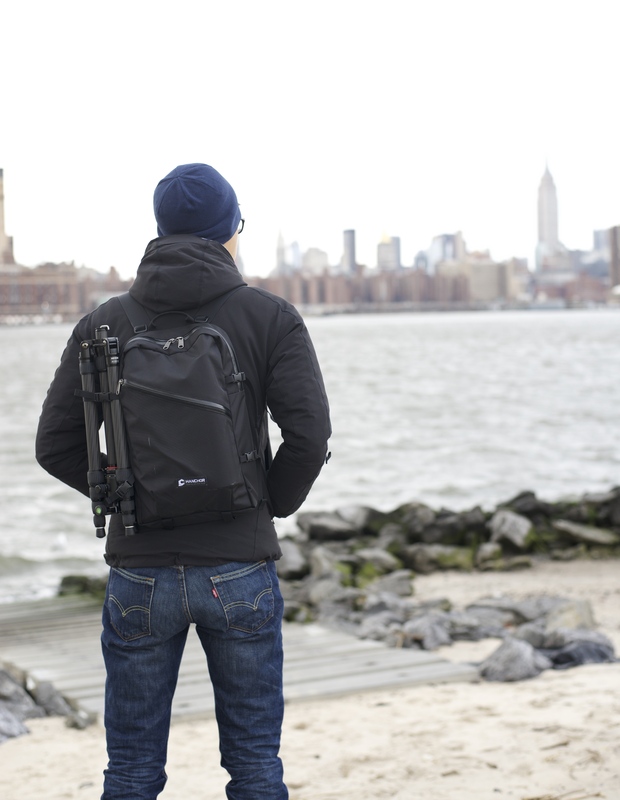 You can attach Hanchor’s daypack, multifunction organizers or side pockets to the backpack. These add-ons can make your backpack more versatile and add extra capacity when needed. The removable daypack, the CLAST Backpack, is a tiny 11 liter bag ideal for short day trips. Hanchor graciously sent me a CLAST daypack along with the Breccia to test out. With all that stuff, the backpack will be fully loaded. The nylon straps aren’t padded, but even when I’ve worn the pack fully loaded, it didn’t hurt on my shoulders. It would be nice if the straps were slightly padded, though. Since they’re so thin, the straps stow away easily. The CLAST can easily attach to the front of the Breccia by hooking a few parts and buckling the CLAST’s tiny compression straps onto the Breccia. I really appreciate the ability to attach and detach the daypack, since you can then leave your main backpack at your hotel or hostel and explore for the day with just the daypack. I did a similar thing when traveling around the world by using the REI Flash 18 as my packable daypack. You can buy the CLAST on it’s own for about $75, or in the Breccia Combo for about $450 which includes the Breccia and all add-ons including the CLAST, side pockets and the organizer. The Breccia backpack has a suspension system similar to that of any hiking backpack. The hip belt and shoulder straps are fully adjustable and can be stowed away. 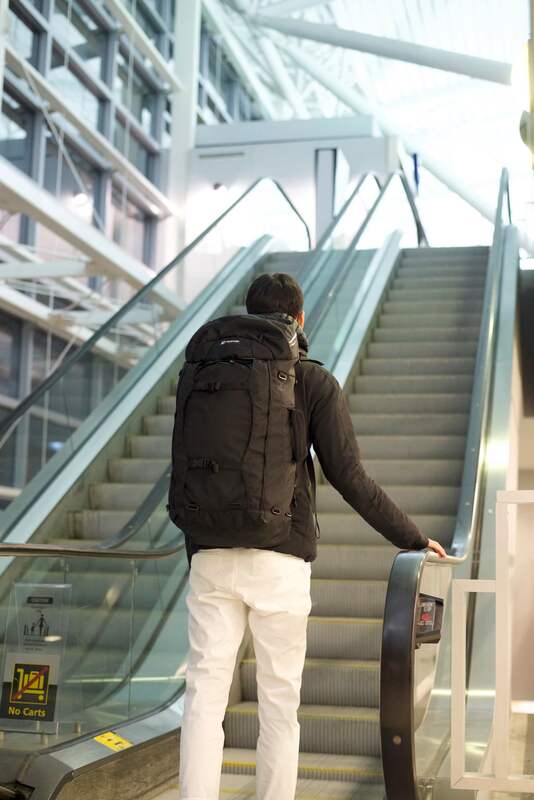 The straps also have thick foam padding, making this travel backpack comfortable to wear for extended periods of time. The straps have what’s almost a triangular lattice, allowing the straps to bend which really conforms to the body. The Hanchor Breccia backpack also has an internal aluminum frame, helping to transfer weight to the hips. There’s a foam back-pad making the backpack rest comfortably against the back. The pad can be removed and unfolded to be used as a mat, however I almost never remove it. One suggestion I’d make is that the back could use a little ventilation. Also, hip belt pockets would be a nice add-on. The Hanchor Breccia travel backpack is made of Cordura 420 denier nylon and has robust components. The zippers are all smooth, and there aren’t any frays or imperfections. I’d expect for it to last a long time. The fact that the Breccia backpack is panel loading makes it easier to organize your clothes and gear. By using the panel loading opening, you can quickly access anything you need. 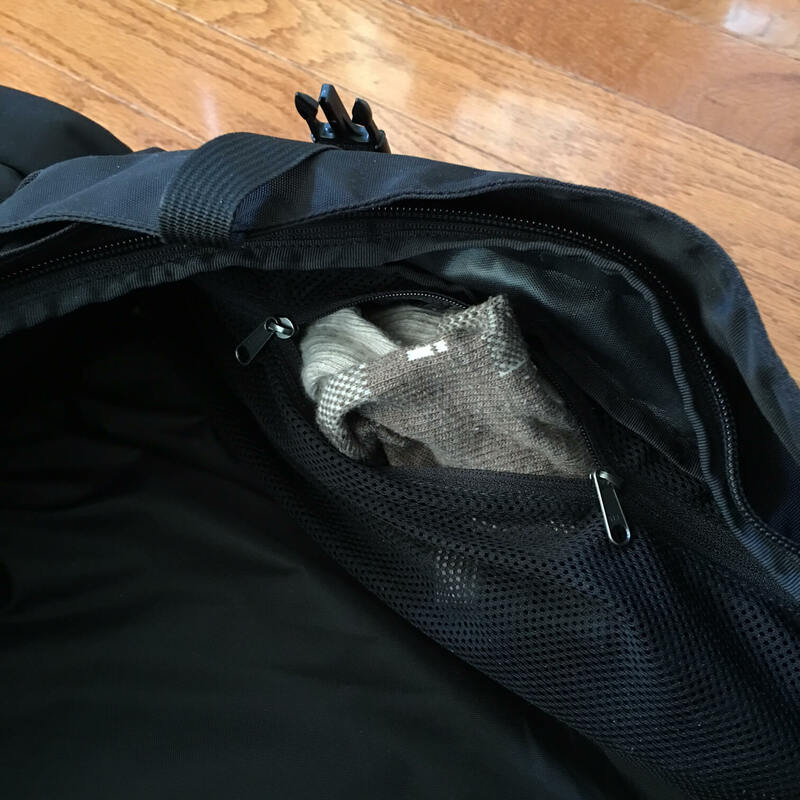 Inside the backpack’s main compartment, there’s a hydration sleeve. 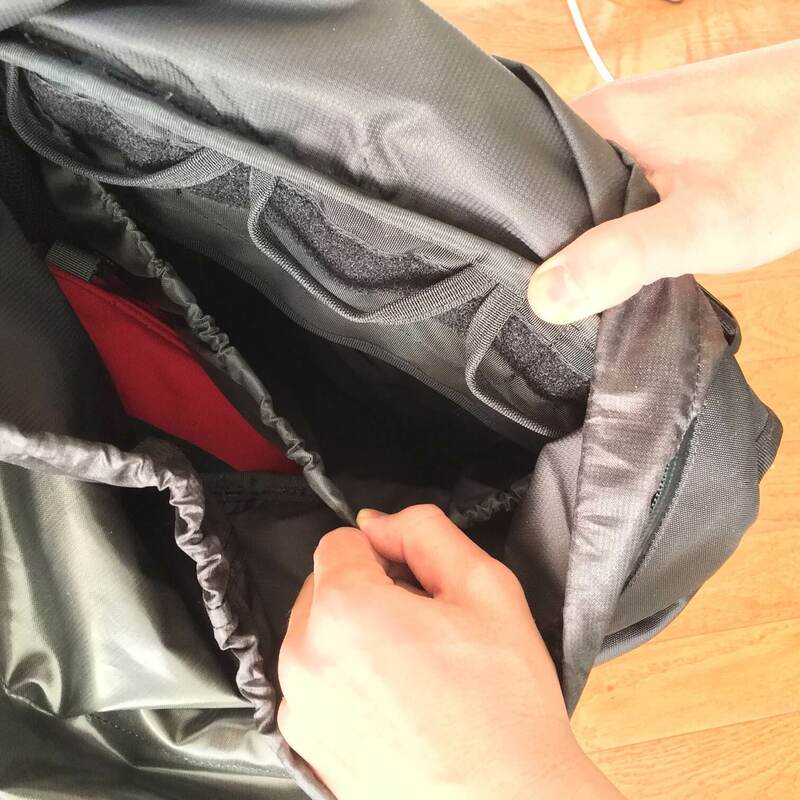 At the sides of the main compartment are mesh zippered pockets, perfect for undergarments like socks or smaller items and accessories. The main compartment is large and doesn’t have any dividers, making it good for holding bulky gear. 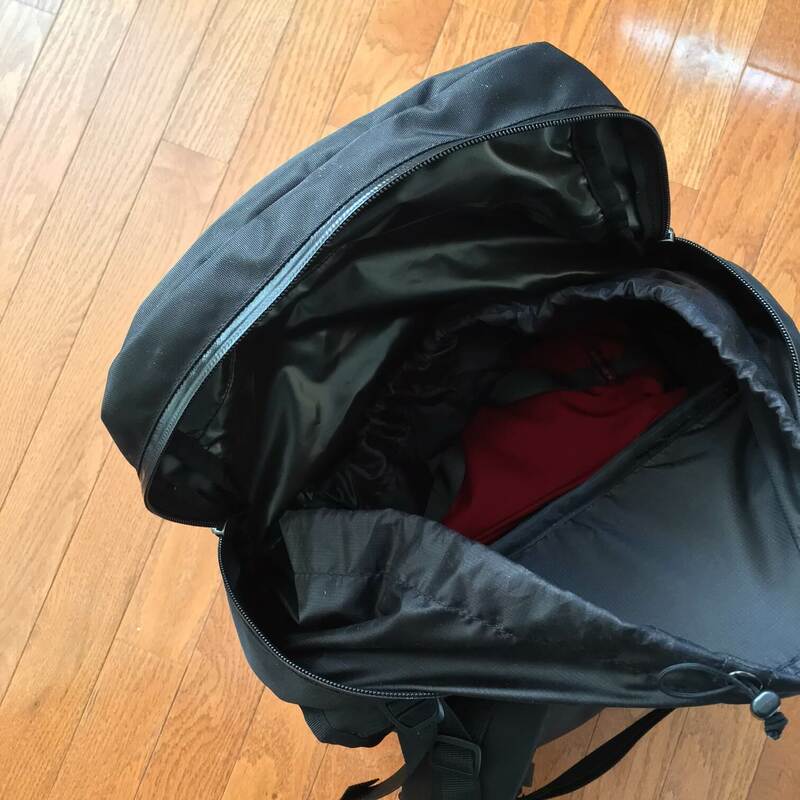 If you’re packing clothes for a long trip, you could pack the main compartment like you would a in a suitcase. 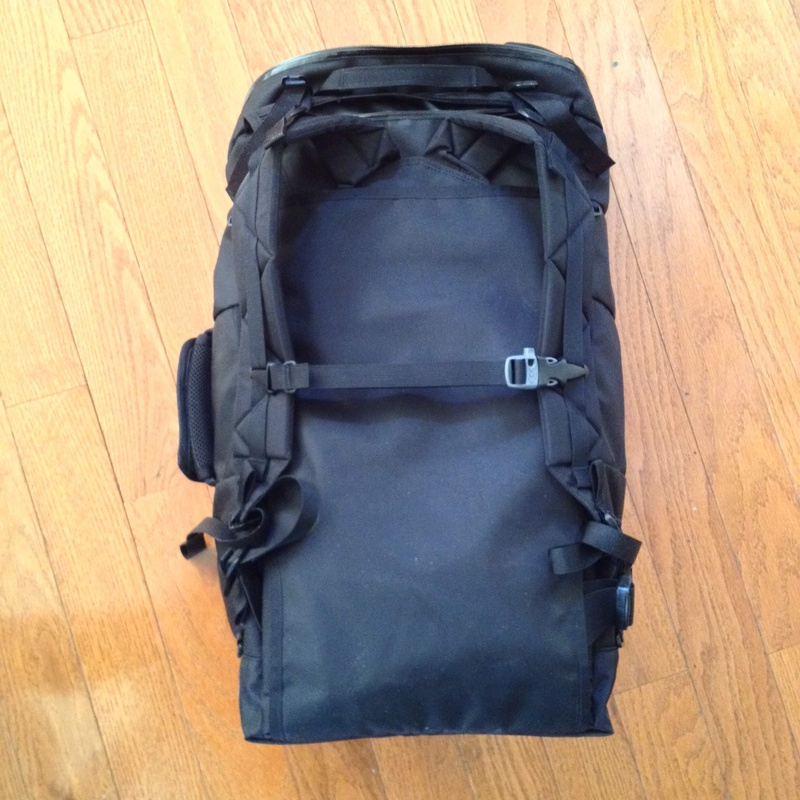 I’d recommend using packing cubes with this backpack – or any backpack in general. Packing cubes are like portable drawers and make it a lot easier and less of a hassle to organize your clothes. 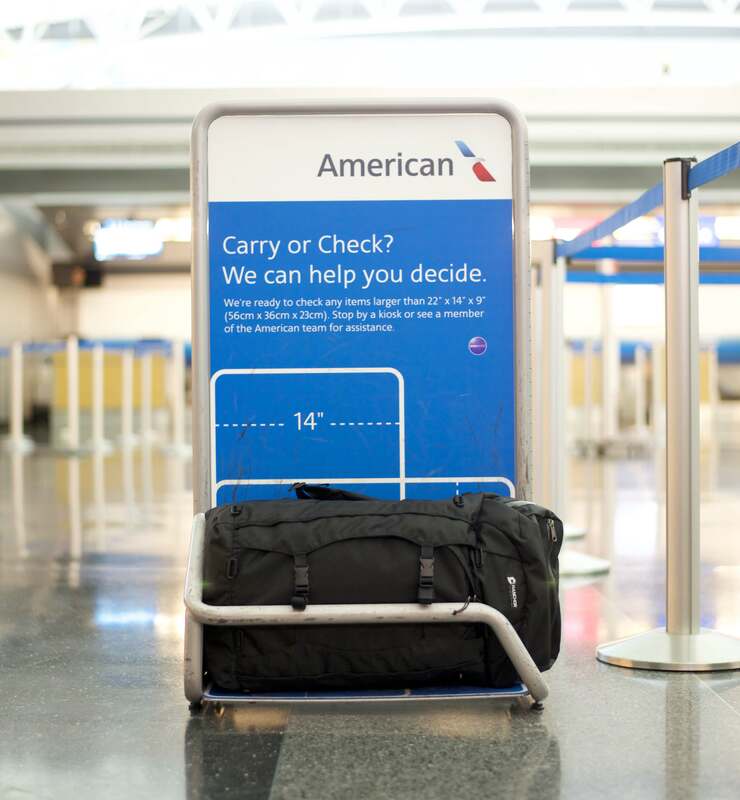 You can read more about the pros and cons of packing cubes. From top of this backpack, you can access the main compartment, and you can also store some items in the top pocket. The top pocket is large enough to hold a jacket and is great for carrying items you’ll need to access quickly. Also on the top of the bag, there’s a smaller top pocket, great for holding accessories or tickets. There’s a pocket inside of this pocket to hold other more valuable items, possibly a hard drive, or your keys. There’s also a hidden pocket at the back of the backpack, right above the shoulder straps. This is perfect for holding cash or your passport or boarding pass. In the cons section, I’ve included some information on how I think the Breccia could have better laptop compartment. Maybe a side water bottle pocket would be a nice addition, but other than that, the Breccia has all the organization you’ll need. Can be difficult to stow away the shoulder straps. You have to feed the ends through a plastic clasp in order to detach them from the bottom of the pack to stow them away. A durable snap-fit buckle (like the one on the hip belt) would make it easy to clip the shoulder straps on and off. 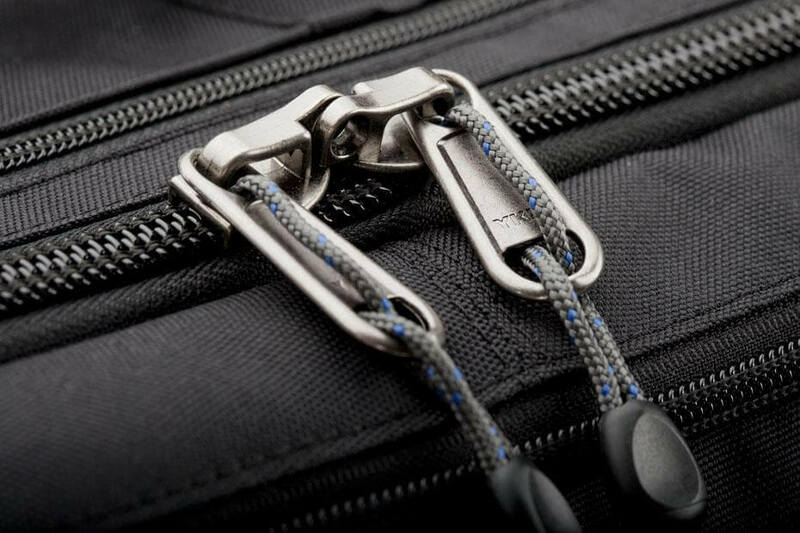 These types of zippers would be safer and make it a lot easier use a luggage lock to secure your bag. Also, the Breccia can be pricey, especially on a backpacker’s budget. At retail $255, it’s on the higher end of my travel backpack price spectrum. ($255 is the price for just the Breccia. If you want the CLAST daypack, you’ll have to add another $75.) The Hanchor Breccia travel backpack is made with very high quality materials, and I’d expect it to last a long time, but the price tag can be hard for some. 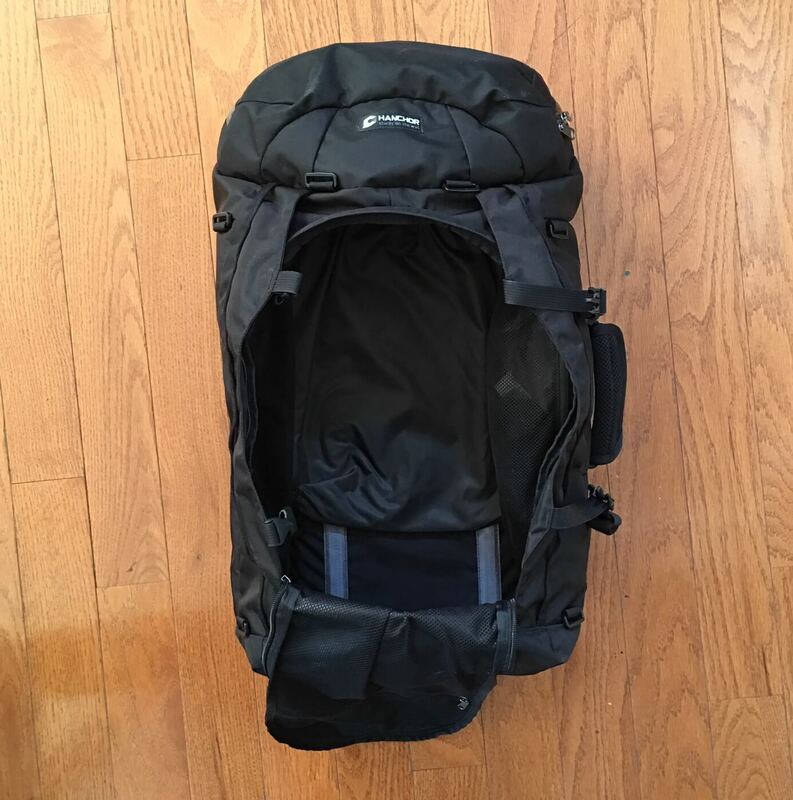 Read more: How Much Should I Spend on a Travel Backpack? Right now, I think it’s great that the pack is both top loading and panel loading. The panel loading feature could be improved a bit, though. The panel loading opening is a bit narrow. If it were wider, it would be easier to access clothes and gear inside. Also, the compression straps cover the panel loading section. In order to open the panel, you have to undo the compression straps. If you have the CLAST daypack attached, you won’t be able to open the panel loading pocket. The current design, the only place to put a laptop is in the hydration sleeve, which is located inside the main compartment. If I were going through airport security and had to take my laptop out, I’d have to open top zipper, undo the drawstring, then pull the laptop out. 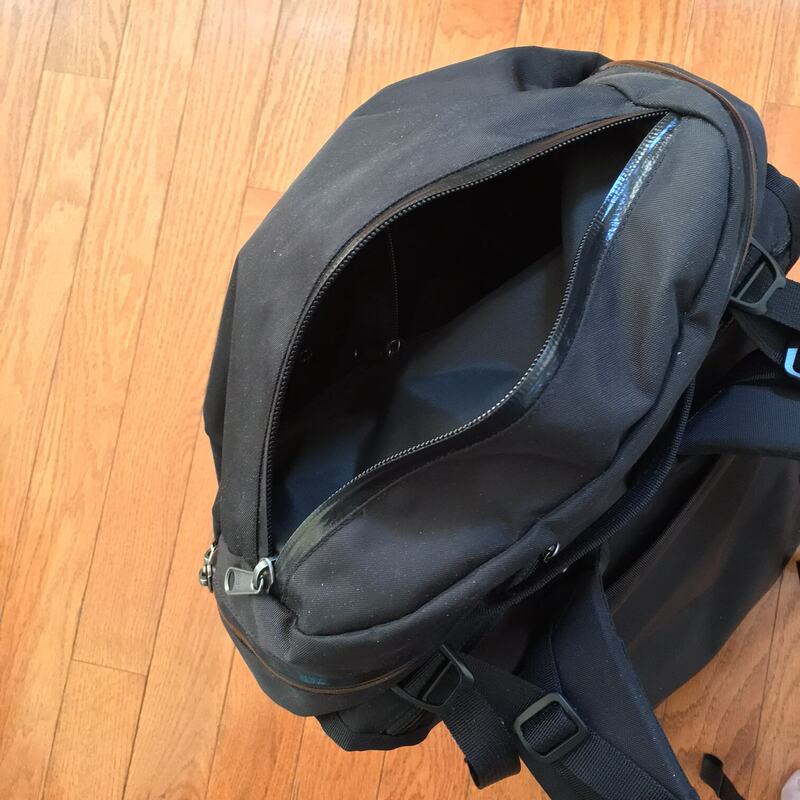 This can be a hassle, especially if there’s stuff inside the top pocket, and it can be hard to put the laptop back in the bag, even more so when the bag is fully loaded. 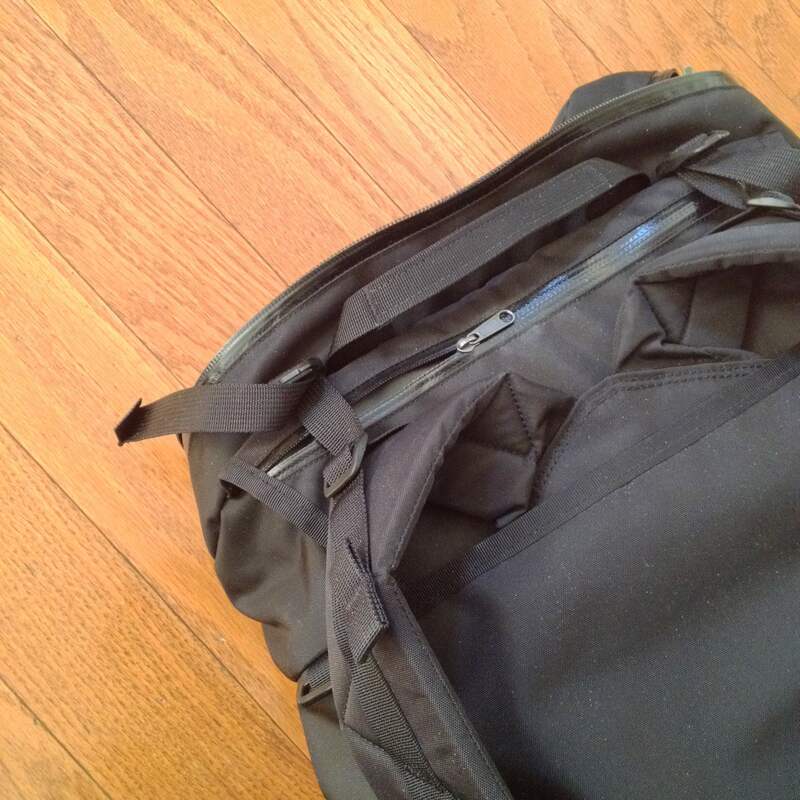 If there was a pocket specifically designed for a laptop that was between the straps and the main compartment, like in the eBags Motherlode, it would be a lot more convenient. Overall, the Hanchor Breccia travel backpack is a high quality and well designed backpack. There are some improvements which can be made, but the Breccia is still a solid choice for adventure travelers and urban travelers. I’ve rated the Breccia highly in every category and it receives an overall 8.8/10 rating. The Hanchor Breccia backpack costs around $255, and the add-on CLAST daypack costs another $75. You can also purchase the Breccia Combo, which includes all of Hanchor’s Breccia accessories and add-ons. 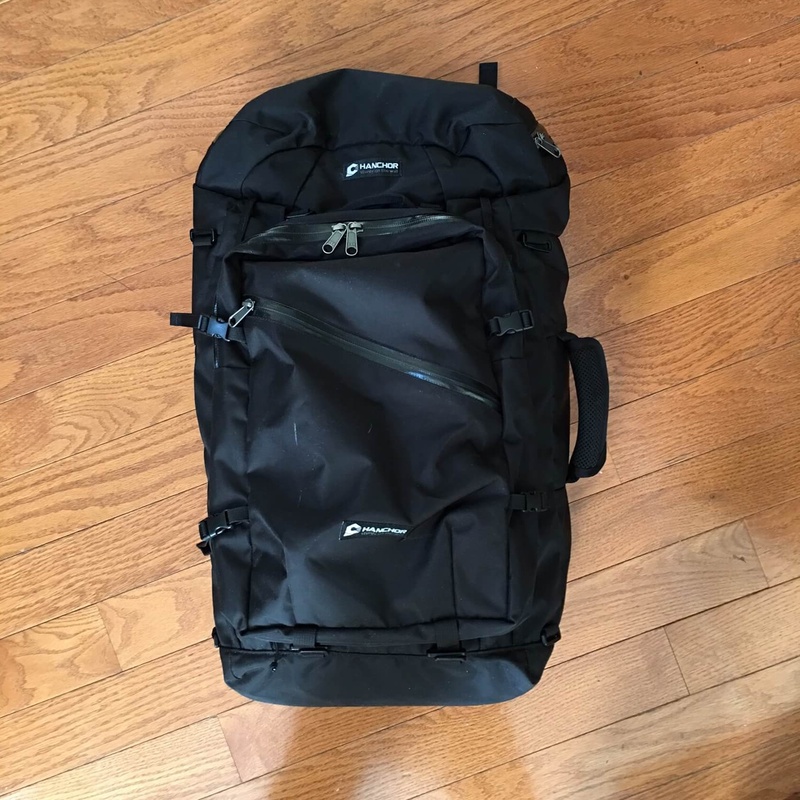 The Breccia Travel Backpack was provided for this review. 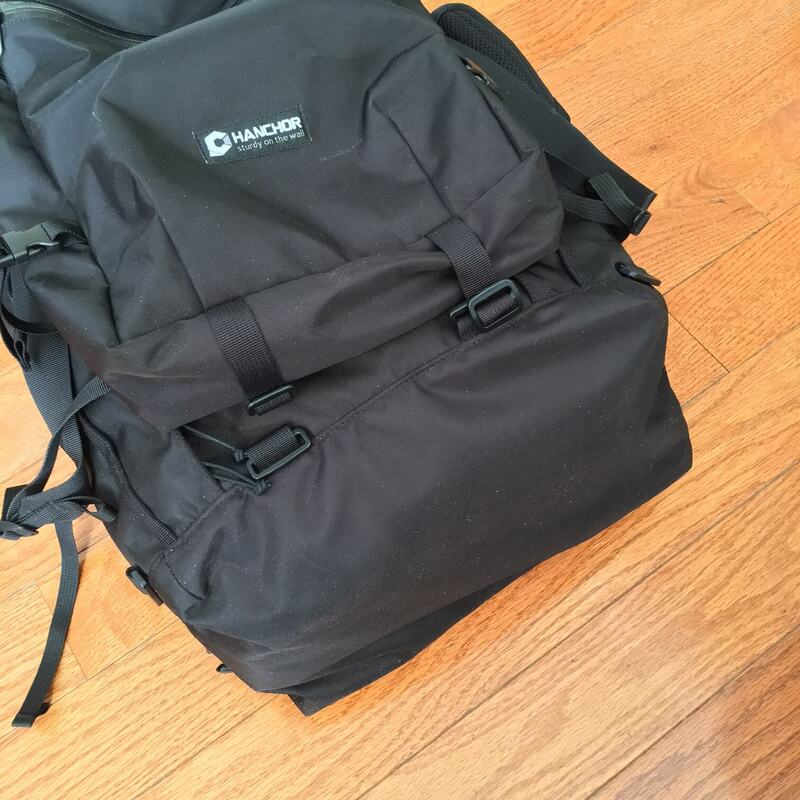 As always, this Hanchor Breccia Backpack review contains only my honest views and opinions. 🙂 Find out more about me and this site here. Hello! 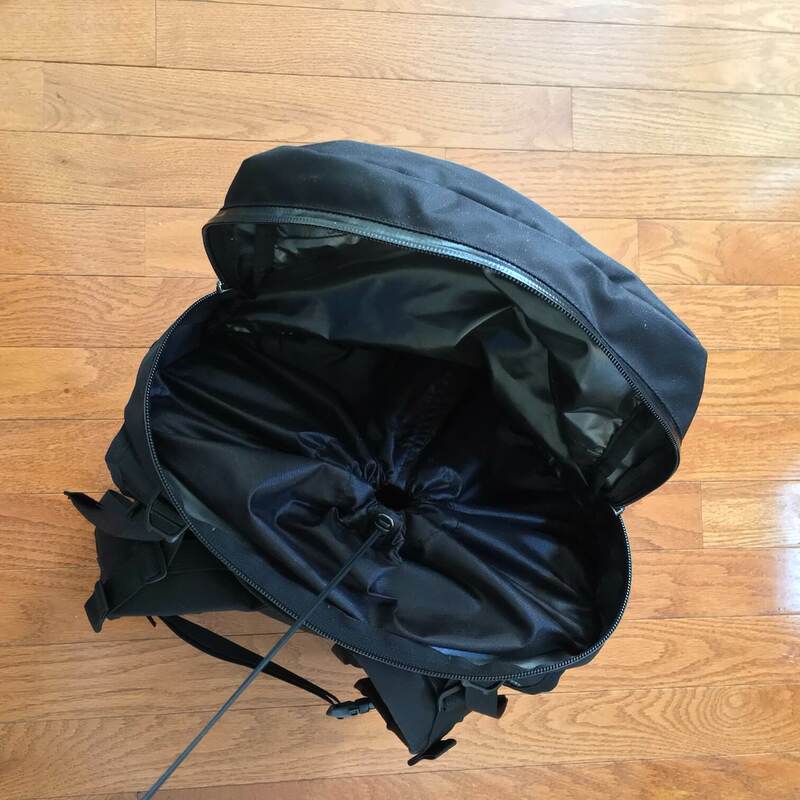 I’ve been on the fence about getting this bag and your review really helped! 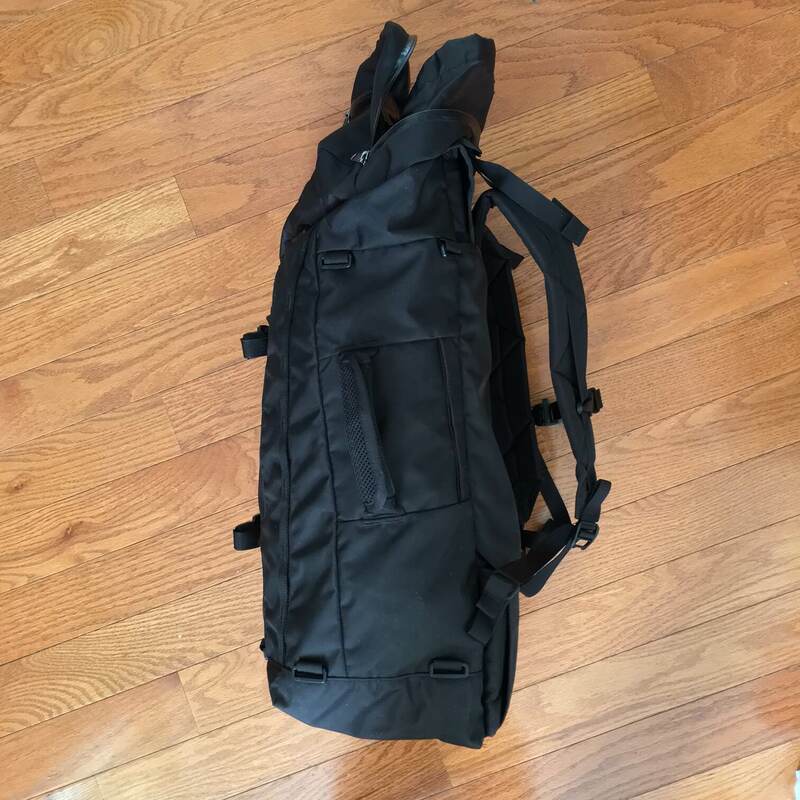 Would it be possible to stuff your laptop (13″ Macbook Pro) into either the compartment for the backpack straps or the compartment for the foam pad? It might make passing through airport security easier if it could temporarily be stored there during check-in procedures. Hey Alex! Glad you found the review helpful. By the way – how did you find the review? The reason for that is the laptop would be directly against your back (there’d be zero padding) and there would be no padding between the laptop and the bottom of the bag. So if you dropped the bag, the laptop would take the impact. You could temporarily do that, the laptop fits fine there, but I’d be careful. I’m actually considering getting that laptop case I mentioned so I can do that. As for accessing the laptop in the foam pad compartment, you’d have to loosen the backpack straps a bit, then pull the velcro flap open in order to access it. It’s easier than if you put the laptop in the hydration sleeve, but still not completely seamless. Well that was a fast reply! I found your website by random chance. I just figured I would search for “Hanchor Breccia Review” and you were one of the first page hits. Been browsing your site since and I enjoy your commentary style (especially your list of realistic pros and cons; it helps me decide whether or not I can accept the quirks of a product). In that case, I think I can live with using the foam area as a temporary laptop compartment for travel through security checks. Would probably grab a case like that too! How do you find the aluminium frame? Does it work as well as hiking bags? I currently use an Osprey Porter 46 when I travel and, as spacious as it is, the lack of an internal frame is killing me on long walks. Sounds great! The frame’s pretty good. It’s comparable to any hiking pack, so would definitely have better weight transfer than a frameless. Hi Jonathan, very informative review! I have been eyeing the Breccia ever since the Kickstarter campaign. With a full load, how do the hip belts hold up? 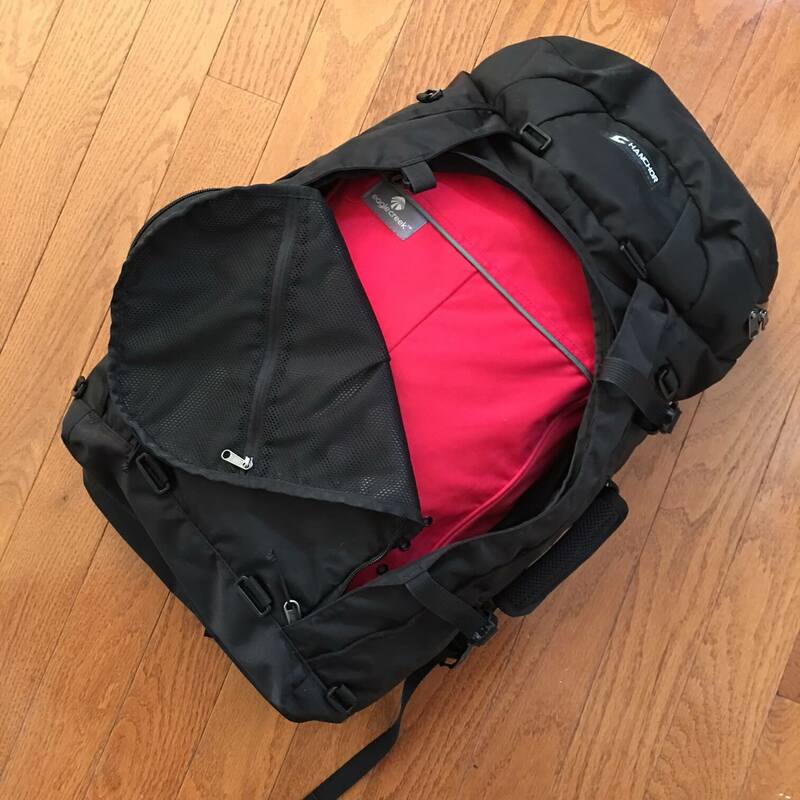 I am currently using a Tom Bihn Aeronaut carry on bag which I love but it doesn’t wear comfortably for hiking trips due to lack of an internal frame and a hip belt. I am looking specifically for a versatile bag that I can take on different adventures and the Breccia seems to fit the bill. I am guessing you didn’t get a chance to check out the side pockets? The hip belts are fine – pretty much what you’d expect on a hiking pack. They’re made of a thick foam and have some padding, but not much ventilation. So when wearing it with a full load, the belt helps a lot and transfers a lot of the weight away from the shoulders. I haven’t tried the Tom Bihn Aeronaut (but heard good things about it) but I think Breccia would be a good adventure-style alternative. I didn’t get to try the side pockets. I’m not sure if they’re completely necessary, they seem kind of pricey, but haven’t tried them so can’t say anything for sure. So just took a look at the Mountain Smith thing. The dimensions for that look to be 8.75″ x 10.5″ x 4.25″ (H x W x D). The basic dimensions for the organizer look similar to those of the Macbook Pro, so it should fit. I will say though, that I’m not entirely sure and the Clast is a really tiny backpack, so if you put the camera organizer, I’m not sure if you could fit much else. Hi! Thanks! Im trying to find a good, small backpack go go with the Breccia to use as a daypack, with room for a camera gear. 🙂 And if the daypack itself can be super light and foldable, then the idea is to fit in a camera insert to make room for stuff. Thanks for the help! I’ll keep looking.